G.F. Handels Oratorio for hundreds of voices, for individual singers and choirs. Georg Friedrich Handel has been born on February 23rd, 1685 in Halle an der Saale. From there his path led him to other German regions, Italy and finally to England where he created works of world wide fame as the king's composer. The "Messiah" is considered his most important work and it is so popular that singers all over the world join together to large "Messiah choirs" to sing it together with great joy. This tradition was born in England in the middle of the 19th century extended to the entire English Empire. Every year, since nearly 20 years, the "Messiah" is being sung in Handel's birth town Halle an der Saale in a large ensemble according to the motto "Happy Birthday, Handel!". Already W.A. Mozart valued Handel's works highly and arranged some of his creations in the style of the 18th century. 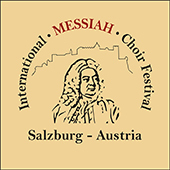 In 2011 the Jubilate Chor Salzburg invited for the first time to the "Messiah Choir Festival" in Mozart's birth town. In 2014 Leonard Bernstein's Messiah arragement from the year 1965 has been performed for the first time in Salzburg. Bernstein transformed Handel's masterpiece into a two-piece oratorio, using the parts "Advent & Christmas" and "Lent & Easter" and maintaining the English original language but using Mozart's instrumentation from 1789 for selected pieces.